DogBizPro is an online software package designed specifically for dog professionals. With our software package, you can quickly and easily manage your client information, dog details, class schedule and much more! With our Client Registration Portal, your clients can even register and pay for classes, events or private training online! We designed DogBizPro to have a straightforward, easy-to-use interface so you don’t have to spend hours learning to use it! We are constantly adding new features and improving our software. 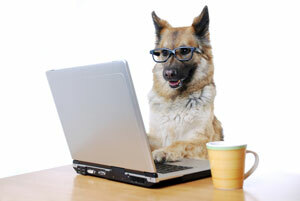 Once you are using DogBizPro you will receive all of these updates at no extra charge! If you have an idea for a new feature, please visit our Wish List page to submit it. We love to hear from our clients!! If you are ready to get started with DogBizPro, please select the version below that meets your needs. You now have the option between our Buy-In and Subscription plans. The Buy-In plan has an upfront cost with a lower monthly fee. The Subscription plan has no upfront cost but the monthly fee is higher for the life of the software. Keep in mind once you do the subscription you cannot switch to the buy-in option without paying the buy-in fee. By signing up you give authorization for us to charge the card you use during registration automatically based on the monthly or yearly option you choose until the point that you cancel your service. Should you decide at any point that you wish to cancel your service you can do so with written notice to sales@dogbizpro.com. We require 15-day notice to cancel prior to your next scheduled payment. Your monthly/yearly payments will be automatically cancelled at that time. Please note: we do not give refunds on purchases. Any paid buy-in/monthly/yearly fee is non-refundable.